A lot of people associate apple pies with fall and the holiday seasons. Me? I like apple pie any time, especially warm with vanilla bean ice cream. Do you need a dessert for a family pot luck? Easter, Mother’s Day? Memorial Day picnic? This recipe is quick and yummy and the crust? Yeah…this unusual crust makes these bars special! Serve 16 with these delicious Apple Pie Bars! 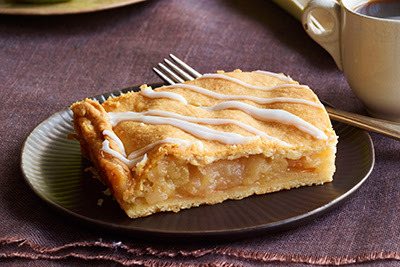 Watch our video to watch how to serve a crowd with these delicious Apple Pie Bars for dessert. 1 – Heat oven to 400ºF. 2 – Beat cream cheese and butter in large bowl with mixer until blended. Gradually add 3 cups flour, mixing on low speed after each addition just until blended. Shape into 2 balls. Place 1 ball on large lightly floured sheet of waxed paper; flatten slightly. Cover with second floured sheet of waxed paper. Roll out dough to 15-1/2×10-1/2-inch rectangle. Discard top sheet of waxed paper. 3 – Spray 15x10x1-inch pan with cooking spray; invert over rolled-out dough. Flip dough and pan together. (Pan will be on bottom.) Remove second waxed paper sheet; gently press dough onto bottom and up side of pan. Toss apples with combined granulated sugar, cinnamon and remaining flour; spread onto bottom of crust. 4 – Repeat rolling out of remaining dough ball to make second rectangle. Remove top sheet of waxed paper; carefully flip dough over apples. Discard waxed paper. Tuck edges of dough down sides of pan to enclose apples. Cut several slits in top crust to vent steam. 5 – Bake 35 to 40 min. or until golden brown. Cool 15 min. 6 – Mix powdered sugar and water; drizzle over dessert. Cool 30 min. before cutting into bars. Tip 1: Size Wise – Balance out your food choices throughout the day so you can savor one of these warm apple bars. Tip 2 : Note – The dough is rolled between the sheets of waxed paper both to help prevent the dough from sticking to the work surface and to make it easier to transfer the rolled-out dough to the baking pan. Prepare recipe as directed, cutting all ingredients in half, assembling dessert in 9-inch square pan and reducing the baking time to 30 to 35 min. or until bars are golden brown. Makes 8 servings. Click on over to the Kraft-Heinz website for a how-to video and all the nutritional details. I checked with Lennox Morgan from ASSASSIN’S MOON and she admits that she can pretty much make this recipe anywhere she can get cream cheese and Granny Smith apples. She makes the full recipe and if she’s really lucky, she gets one bar all to herself. She notes that Tex’s kids really like them too. If you haven’t read Griff and Len’s adventure, you can read MONTANA MOON for free with a Kindle Unlimited subscription, or grab it in digital or paperback from Amazon for your very own copy. Just click on the book cover to get a copy. What about y’all? Apple pie only on specific holidays or is it a year-round treat? This entry was posted in Books, Writing Life and tagged #KindleUnlimited, books, characters, food, fun stuff, links, reading, recipe, series, Tuesday Treats. Bookmark the permalink. This one intrigued me because of the cream cheese in the crust. And as far as I’m concerned, apples only need cinnamn and sugar. 😉 If you give it a try, let me know. It sounds a lot like the Hungarian apple bars my MIL makes, though she grates the apples and she measures by kilograms, lol. But her apple bars are my favorites. I’ve never seen cream cheese added to a crust. That’s very unusual.